Effective brands communicate. In everything from color schemes, to videos, to copy, and more, the brand should keep things consistent, always communicating the brand’s message and capturing its essence. But deciding what to communicate is generally the easier part. How to do it is another story. How do you reach out to different audiences while still keeping your current audience happy? How do you continuously communicate in an interesting and engaging way? The “how” of brand communication ultimately comes down to tone. With a strong grasp of tone, you’ll be able to build marketing strategies that will connect to your target audience and draw in new clients. 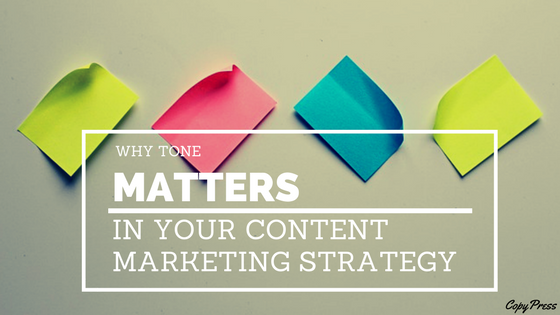 Here’s why tone matters to your content marketing strategy. Think of your most sarcastic friend. The one that always has something clever to say, even if it isn’t the kindest thing to say. With sarcasm, it’s not as much what they say, but how they say it. It’s not the words themselves, but the tone that gives an extra nuance of meaning. That gets us a little closer to what tone in marketing can be. Here’s another example. Think of the difference in how you talk to kids versus how you talk with your best friend. Nothing changes about your physical voice or your accent, but the way you’re communicating changes drastically. The vocabulary you use. The sentence structures. And you probably make the shift almost subconsciously, because you realize that what works with one doesn’t work with the other. So how does that carry over to marketing? You’re only going to reach different audiences by communicating in different ways, just like how you’ll communicate with the kid down the kid down the street than you do with your best friend. That’s tone. It’s in the tone of your colors. Do you go with something bright and a little wild? Or more subdued, professional colors? They’re just colors, but they’re charged with effect. It’s in your copy. What kind of vocabulary do you use? How long is it? Everything about tone comes down to how you interact with your audience. Let’s go back to our kid/best friend example. What if someone your same age talked to you like a child? With a slower pace and easy vocabulary. Wouldn’t you be insulted? Or at the very least, turned off to whatever the individual was saying? Tone can make or break whatever message you’re attempting to communicate. It can propel your audience toward wherever you’re trying to take them, or, if used poorly, it can keep them from ever getting there. Tone significantly influences the effect of your brand. It affects how others feel when they interact with anything your brand produces. With tone in your control, you can influence perception of your brand. But without it in your control, the effect is ambiguous. That’s the thing with tone: it exists whether you intend it to or not. Everything has tone, so if it’s not harnessed, it can make your brand feel inconsistent and unprofessional. That all depends on your audience. Asking what tone is best is like asking what music is best. Some connect with one genre while others detest the same one, but love another. It’s the same with tone. You probably won’t be able to draw in every single individual that interacts with your brand, but you can at least try and draw in your target audience. The best tone is the tone that your audience is comfortable interacting with. To know what tone that is, you need to know your audience. Find out what they prefer. Take the time to do the research. Test out different tones with focus groups or with other methods. It will all pay off if you can find the one that clients can consistently interact with. Maybe your current tone seems to connect well with one audience, but that’s not the audience you’re targeting. While there could be a number of reasons that something is working with one group and not the other, it’s very possible that it could be your tone. So try shifting your tone, using some more research, to connect with your actual target audience. This is where the rubber hits the road. Once you’ve established your audience, you can start building your tone. Before you can get to tone, however, you should have a solid message and know it like the back of your hand. The more established your message, the more ways you’ll be able to convey it. You can’t think about how to say something if you don’t know what to say. Next, consider what effect you want your tone to have. Do you want to leave your audience laughing? Smirking at something clever? Or nodding with a satisfied frown? That effect will be influenced by the vocabulary you use, so you should establish parameters for that as well. When you get to building your tone, it will be centered around a combination of your message and the effect you want that message to have. Once you’ve finished the preliminary steps, get writing. Write copy. Write an article. Write headlines. Tone is ultimately something that needs to be found. Uncovered. It won’t come immediately. Strong tone is refined over time. It’s a process that takes patience. After you’ve found that sweet spot in your tone, stay consistent across the board. With enough consistent exposure, your tone will become distinguished and easily recognizable. If you feel like your content marketing strategy has hit a standstill, consider taking a look at your brand’s tone. It may be the perfect time for a refresh and a fresh, strong tone is just what the doctor ordered. The Importance of Transparency in Marketing Provocative Content: How Far Is Too Far?